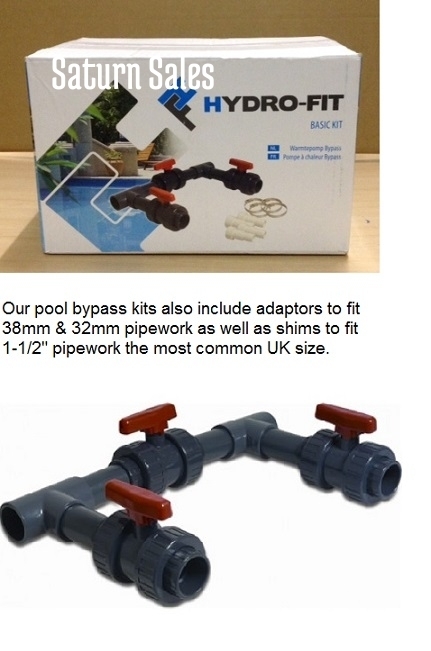 2 x Adaptors 50mm to 1 1/2"
Our Pool heat pump bypass kit is designed to be used with all our ranges of pool heat pumps. In order for a heat pump to operate at its maximum efficiency you need to optimise the amount of water that flows through the heat pump for maximum heat transfer into the water, this is the role of a pipework bypass kit. Our bypass kit will fit 50mm and 1 1/2" pipework, the most common UK pipework sizes. It also includes adaptors to go from 50mm to 38mm and 32mm hose tail sizes, which are more commom pipework sizes for above ground pools.